Mayor of The Hills Shire, Councillor Yvonne Keane has welcomed more than 800 Australian citizens during her term as Mayor. 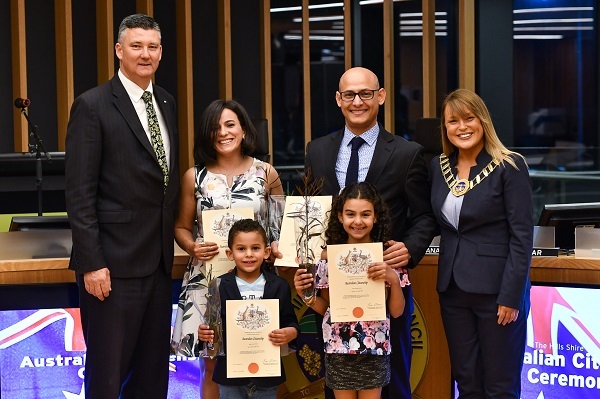 Mayor Keane said she had enjoyed attending more than ten citizenship ceremonies and meeting The Hills newest Australian citizens. “I love listening to the amazing stories from our newest Australian citizens,” Mayor Keane said. “My favourite part of the ceremony is seeing the big smiles on their faces as they are officially handed their Australian Citizenship,” Mayor Keane added. On Monday, July 24, Mayor Keane welcomed 121 Australian citizens at an Australian Citizenship ceremony at The Hills Shire Council. Mayor Keane said citizenship provides an occasion for individuals, families, schools, community groups and organisations to celebrate and reflect on Australia as a great county to live. “I am pleased so many residents chose to pledge their love and devotion to Australia,” Mayor Keane said. “In fact, we had residents from various countries including India, Iran, China, the Philippines, Zimbabwe, Thailand, Taiwan, the United Kingdom, Vietnam, South Africa, Canada and Japan who have chosen The Hills as their home.